Here we consider the quantitative Caputo and Canavati fractional approximation of positive sublinear operators to the unit operator. These are given a precise Choquet integral interpretation. Initially we start with the study of the fractional rate of the convergence of the well-known Bernstein–Kantorovich–Choquet and Bernstein–Durrweyer–Choquet polynomial Choquet-integral operators. Then we study the very general comonotonic positive sublinear operators based on the representation theorem of Schmeidler . 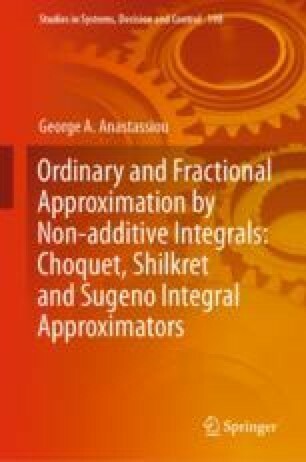 We finish with the approximation by the very general direct Choquet-integral form positive sublinear operators.